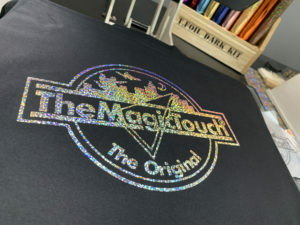 TheMagicTouch has released a new transfer process which will allow newcomers and experienced operators in the garment decoration industry to get involved at an entry-level cost that has never seen before. P&P editor Melanie Attlesey reports. T.Foil Dark, as this new transfer process is known, received its formal launch at Printwear & Promotion LIVE! in January, where the product was demonstrated in front of throngs of people. The product was met with fascination. The T.Foil Dark transfer process allows the user to produce stunning metallic results quickly and very cost-effectively onto almost any garment regardless of colour or textile composition. The process involves no cutting or weeding and offers the ability to decorate a black or any other colour T shirt with transfer and foil for less than £1. T.Foil Dark can be used on any fabric composition including cotton, polyester and mixed fibres. But what the crowds were not told about was the secret weapon used – a printer that costs only £150. T.Foil Dark transfer paper can be printed using selected TMT/Oki CMYK printers without the need for white toner. This means someone new to the industry can purchase either the Oki C332 or C612 standard CMYK A4 LED laser printer from £150. This includes a starter set of toners (good for 500 transfers) and a three-year warranty. 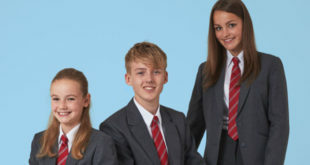 Jim Nicol, managing director of TheMagicTouch, explains: “Together with our new SpaceControlBasic RIP software, T.Foil Dark transfer paper, choice of foils and the CMYK printer it is now possible to reap the benefits from this innovation for less than £300. While Jim is quick to point out how risk-free it is to now get started in the garment decoration industry, he is just as quick to point out that users can’t be complacent and expect business to fall into their laps. 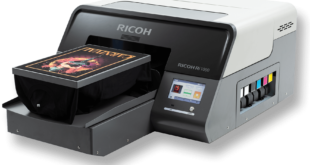 What also makes the Oki C332 and C612 printers ideal for start-ups are that they can be used with any of the other eight transfer papers from TheMagicTouch’s range compatible with the CMYK parameters, providing any newcomer with a full arsenal at their disposal.